( Newton, NC - - September 12, 2010 ) Rain may have washed out the initial running of Ruckus House Night presented by Steele Rubber Products, but that just proved that there is nothing better than Sunday afternoon short track racing in the sunshine. 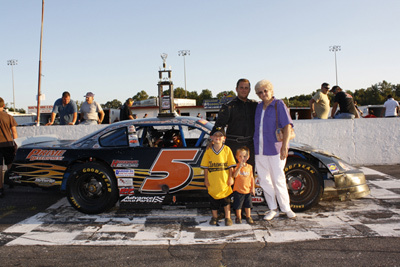 The night featured the NASCAR Whelen All-American Series with appearances by the Bojangles Late Models, the Everything Attachment Super Trucks, the Hickory Street Stocks, the Hickory 4-Cylinders, the Red Baron Race Parts Hobby Stocks and twin 25-lap features for the Advance Auto Parts Limiteds. It was truly a great afternoon for driver of the No. 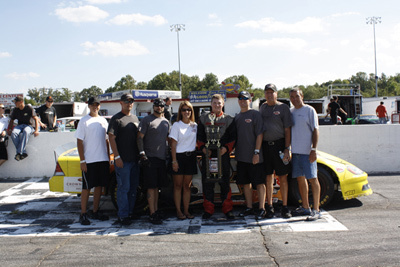 88 of Kyle Mansch as he earned his seventh Bojangles Late Model win of the season. . 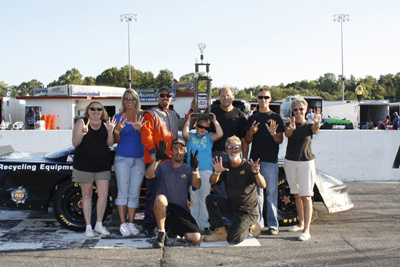 The Bojangles Late Models took to the historic short track for their 50-lap caution free feature event. The No. 88 of pole sitter Kyle Mansch brought the field to the green. The No. 92 of Candace Muzny broke into the top five early in the race, moving into position on lap two. Mansch and the No. 5 of Dexter Canipe Jr. spent the first half of the race running side by side until Mansch began to inch away. With 20 laps to go, Canipe Jr. pulled back under Mansch looking for a shot at the lead. Canipe Jr. took over the top spot on lap 34, but Mansch quickly reclaimed the position on lap 35 and again began to pull away. The No. 51 of Josh Wimbish maneuvered around Muzny to move back into the top five on lap 41. With one lap to go Canipe Jr. pulled back under Mansch, as they headed out of turn four Canipe Jr. wiggled allowing Mansch to take home the win. Canipe Jr., the No. 10 of points leader Andy Mercer, the No. 43 of Jesse LeFevers and Wimbish finished second through fifth respectively. The Advance Auto Parts Limiteds took to the track for their first of two 25-lap twin races with the No. 5 of Dexter Canipe Jr. leading the field to the green flag. Canipe Jr.'s lead didn't last long as the No. 12 of Austin McDaniel took over the top spot on the first lap. The two would maintain a tight battle for the lead during remaining 24 laps. The first caution of the race fell on lap 19 for debris on the track. The second and final caution fell shortly after, when the back of field stacked up on the restart causing damage to the No. 21 of Monty Cox and the No. 71 of Jason Smith. With five laps to go the No. 07 of Tyler Church moved into the third place position, leaving the No. 11 of Matt Piercy, the No. 51 of Waylon Flynn and the No. 2 of Nick Waycaster to duke it out for fourth. The three went three wide as they headed into turn four allowing Waycaster to grab the fourth place position, Flynn took over fifth and Piercy was pushed back to sixth. Meanwhile McDaniel and Canipe Jr. continued to battle for the lead with McDaniel grabbing the win leaving Canipe Jr. to finish second. Church, Waycaster and Flynn rounded out the top five. The second 25-lap race for the Advance Auto Parts Limiteds was just as eventful as the first with the first caution falling on lap three after the No. 15 of Sheflon Clay and the No. 77 of Pietro Fittipaldi connected heading into turn two sending both drivers into the spin cycle. The second and final caution fell as the field went back to green flag racing after officials determined the No. 8 of Mark McIntosh jumped the restart. The No. 5 of pole sitter Dexter Canipe Jr. jumped out front after the restart creating a four car lead over field by lap ten. During the final ten laps the No. 11 of Matt Piercy and the No. 51 of Waylon Flynn had created an intense battle for the sixth place position. Piercy took over the spot on lap 22 as he and Flynn came off turn four. 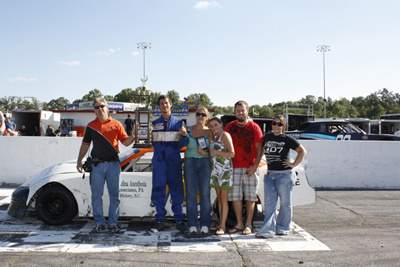 Canipe Jr. led the field to the checkers capturing a win for the Ruckus House on their special afternoon. McIntosh and the No. 12 of Austin McDaniel finished second and third. The No. 07 of Tyler Church and the No. 2 of Nick Waycaster came across the line door to door, with Waycaster only inches ahead taking home the fourth position leaving Church to come home fifth. The Everything Attachment Super Trucks hit the asphalt with the No. 16 of Clint Fields leading the nine truck field. The No. 98 of Jody Measmer jumped into the lead on the first lap leaving Fields to follow behind in second. The first caution fell on lap two after the No. 7 of Justin Crider made contact with the No. 09 of James Kirkham, sending Kirkham for a spin in turn two. It didn't take long for the second caution to wave as the No. 13 of Cory Cavazos spun around heading down the back stretch. As the field headed back to green flag racing the No. 33 of Jeremy Birch, the No. 6 of Brandon Setzer, the No. 11 of Thomas Beane and the No. 69 of Trevor Hignutt began a battle for third. The trucks were three wide as they drove into turn three trading position back and forth. As they entered turn four Hignutt was squeezed out of the pack while Birch grabbed third, with Setzer and Beane following behind. .
On lap 13 caution number three waved for fluid on the track after Cavazos experienced mechanical issues. A fourth caution soon followed Beane went for a spin coming out of turn four, collecting Hignutt and Crider on lap 17. The red flag was brought out for track clean up. On lap 21 Birch made his way into the second place position, but Setzer was on a run towards the front and took over second on lap 25. The fifth and final caution waved on lap 33 after Birch went for a spin on the exit of turn two. It was a green, white, checkered finish with Measmer leading the pack and Setzer following behind. Setzer, itching for a win, pulled under Measmer on the final lap. The two shot out of turn four and headed down the front stretch side by side, Measmer made it to the checkered line only inches ahead of Setzer, taking home the win. Setzer, Fields, Beane, and Birch rounding out the top five. The Hickory Street Stocks put on a great show during their 30-lap caution free event. The No. 21 of Roger Pitts II was on a run grabbing the lead from the No. 1 of Taylor Stricklin on lap four. On lap ten the No. 03 of Kevin Eby pulled under the No. 9 of Charlie Watson looking for his opportunity to take over the third place position, capturing the spot on lap 13, leaving Watson to ride around fourth. The No. 64 or Marshall Sutton set his sights on Watson and the fourth place position as he stayed glued to Watson's bumper. On lap 24 Sutton pulled alongside Watson taking over the position with five laps remaining. Pitts II led the field to the checkered flag with Stricklin, Eby, Sutton and Watson in tow to complete the top five. . The Hickory 4-Cylinders made their way onto the asphalt for their 25-lap event. The No. 18 of Devon Haun brought the 13 car field to the green flag. The front of the field quickly spread out during the first five laps and continued to ride around single file until the first caution was brought out on lap 15 for fluid on the track. The second caution waved during the restart after the No. 59 of Donn Wardo went for a spin on the entrance of turn four. As the field went back to green flag racing the third caution waved after the No. 17 of Curtis Pardue spun into the outside wall heading out of turn three. On lap 19, the No. 4 of points leader Adam Beaver made his way into the second place position. A fourth and final caution fell on lap 23 after the No. 51 of Nathaniel Knupp experience mechanical issues leaving debris on the track. It was a green, white, checkered finish for the field with Haun still leading the way. On the final lap Beaver pulled to the outside of Haun looking for a chance at the lead and the win. Haun held on strong, grabbing his first win of the season leaving Beaver to settle for second. The No. 21 of Todd Harrington, the No. 09 of Randy Canipe and the No. 1 of Michael Tucker completed the top five. The Red Baron Race Parts Hobby Stocks came to the green flag with the No. 85 of Jeff Wiesner leading the way. The No. 47 of Tyler McKenny quickly took the lead on the first lap, while Wiesner fell back to the fourth place position. On lap ten the No. 28 of Casey Pierce spun around on the back stretch, but straightened his ride around and got back up to speed, so no caution fell. Pierce managed to work his way back out front moving into the second place position on lap 17. McKenny led all 20 laps and captured the win with Pierce, the No. -1 of Ronald McNeil, the No. 31 of Steven Willis and Weisner to make up the top five. 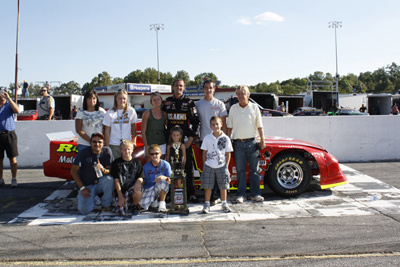 The NASCAR Whelen All-American Series comes to an end for the 2010 racing season on Saturday, September 18, 2010 as Hickory Motor Speedway hosts AT&T Championship Night presented by Gaston Rentals. 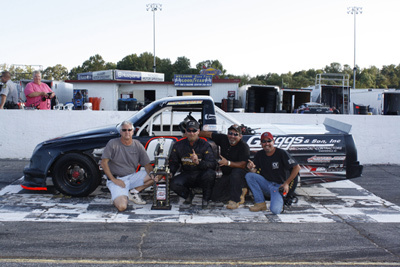 The night will feature a 100-lap event for the Bojangles Late Models along with racing action from the Advance Auto Parts Limiteds, the Everything Attachment Super Trucks, the Hickory Street Stocks, the Hickory 4-Cylinders and the Red Baron Race Parts Hobby Stocks. Grandstands open at 5 PM with qualifying immediately following. An On-Track Autograph Session will take place at 6 PM with the green flag dropping at 7 PM. Tickets for this great night of racing are only $10 for adults, $8 for teens and seniors, $5 for kids ages 7-12. Remember… if you're not here, you're missing out!